﻿James Cook University's research in 'Environmental Science and Management' and 'Physical Geography and Environmental Geoscience' has been rated above world standard, achieving the maximum possible score in ‘﻿Excellence in Research for Australia’ ranking 2015﻿, thanks largely to our group's work. To see our scientific papers, go to People and click on the staff member's name, or click here and search by author name or topic. To see our recent theses, go to People and click a thesis title at the bottom of the page. Arresting the build-up of atmospheric CO2 is one of humanity’s biggest challenges. As part of a global effort, we are testing the idea that the removal of carbon dioxide from the atmosphere through weathering of rocks can be accelerated by applying crushed basalt to sugarcane fields. Click here for more information. Funded by the Leverhulme Trust, 2017-2021. Contact Paul Nelson. Catchment water balance modelling can help make more informed water allocation decisions. 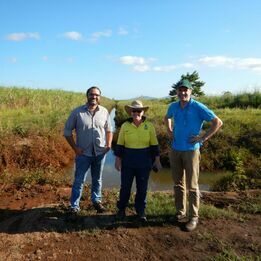 This project uses stable isotopes of water (rainfall, stream and groundwater) to improve predictions made by catchment water balance models for the Tully and Barron River catchments in North Queensland. This project brings smart city technology (Internet of Things and smart sensors) into urban water management to improve urban water quality discharging to the Great Barrier Reef. The project is collaboration between Cairns City Council and JCU. Denitrifying bioreactors are an on-farm technology for removing dissolved inorganic nitrogen from agricultural drainage water. They may have a role in reducing nutrients running to the Great Barrier Reef lagoon. This project, in partnership with Jaragun Pty Ltd, will assess their efficacy in the Wet Tropics. Click here for more information. The JCU Cairns Green Wall , near the Co-Op, is both a teaching and research tool. It uses the Atlantis Gro-Wall system and has a variety of native and exotic plants selected for their aesthetic properties and ability to thrive in this climate. Soil water content is measured continuously and can be monitored via the Internet or your mobile phone. Funded by the ‘JCU Sustainability Small Grants Program’. Contact Han She Lim. This project will examine changes in mangrove forests in the Darwin area over 30 years. We will develop an algorithm to process images from the Landsat archive, and then quantify trends in phenological and spatial variations over time. Did human arrival in Australia lead to the extinction of the megafauna and lasting change to Australian ecosystems? In this project we are separating human activity from global climate change effects in shaping the modern environment of northern Australia. Panama disease (Fusarium Wilt) poses a major threat to the Australian banana industry. We are finding out what soil properties suppress the disease and how suppressiveness might be enhanced. Funded by Hort Innovation (BA14014 2.6), 2016-2019. Contact ﻿﻿Paul Nelson﻿﻿. Raine Island is a low-lying coral cay vulnerable to many climate change impacts. It also has great cultural importance, and is the world’s largest nesting site for green turtles. We’re working to understand how the island will change into the future, and what we can do about it. What type of sediment transported from rivers via floods has the greatest influence on water clarity in the Great Barrier Reef lagoon? The research will identify the key properties and sources of this material using cutting-edge tracing techniques, enabling more effective actions to improve water quality. Agricultural soils are a significant source of the greenhouse gases nitrous oxide and carbon dioxide. We are examining how enhanced-efficiency fertilisers and mulching practices might be used to reduce greenhouse gas emissions from banana and mango fields. We use stable isotopes of carbon, oxygen and hydrogen as tracers of processes in the carbon and water cycles. Portable laser spectrometers enable us to carry out high-frequency, real-time analysis to help identify sources and sinks of carbon in forest and savanna landscapes and to understand tropical rainfall patterns and water use by plants. Records of past environments can be found in caves, in the faeces (guano) of bats or birds roosting there. We are exploiting these records to reconstruct palaeoenvironments, especially the extent of savannas and rainforest refugia, over the Last Glacial Period in island southeast Asia. We continuously monitor water and geochemical fluxes at the Daintree Rainforest Observatory. The work helps us understand how water moves through a rainforest system and provides baseline data by which to compare impacts of climate change and human activity on tropical catchments.